MIDI CONTROLLERS(USB to 5 pin) options? 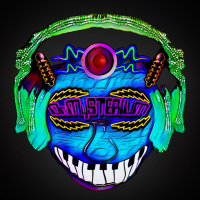 What devices have you used or ideas do you know of to convert a USB midi controller to be used with 5 pin midi devices? It isn’t cheap though, might not be worth trying to convert a usb only controller. If Ive understood, this is to connect a usb midi controller to a midi music module. 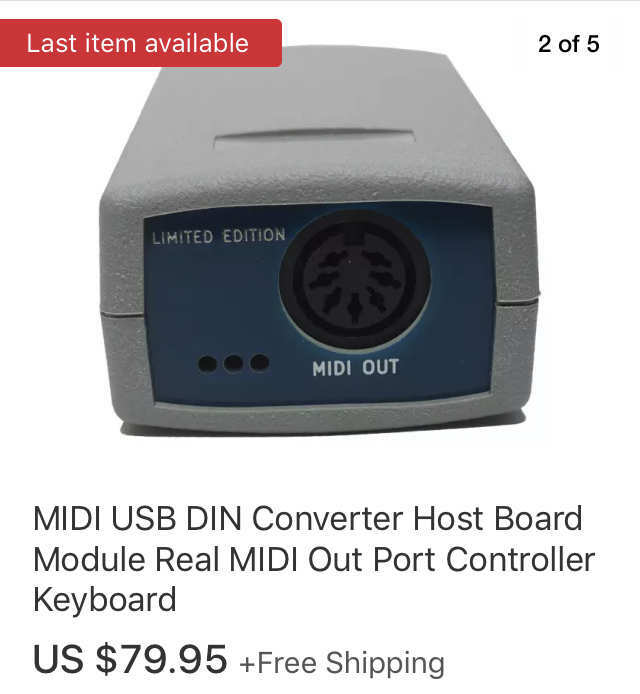 AFAIK the MidiSport will connect a usb computer/host to your 5pin midi gear but not a usb midi controller. It is very handy however if you ever need a midi merge, the AE version is class-compliant (ipad friendly) but needs power/CCK 2 connector. I would use my iCA4+ but its overkill for this situation. I see, yeah for that I'm using iCM4+ as well. This one is totally dated, but here’s a note on it. I bought this one 7 years ago & had some trouble with the drivers, so it went into a drawer until last fall, when I was messing around with my circuit as a controller. It’s a class device, so there’s no need for drivers anymore and it works. 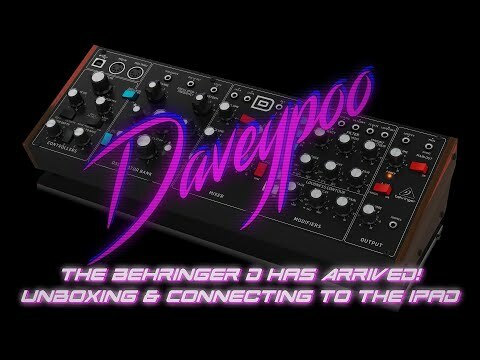 Lately I use it for I/O between a microKorg and editor software. 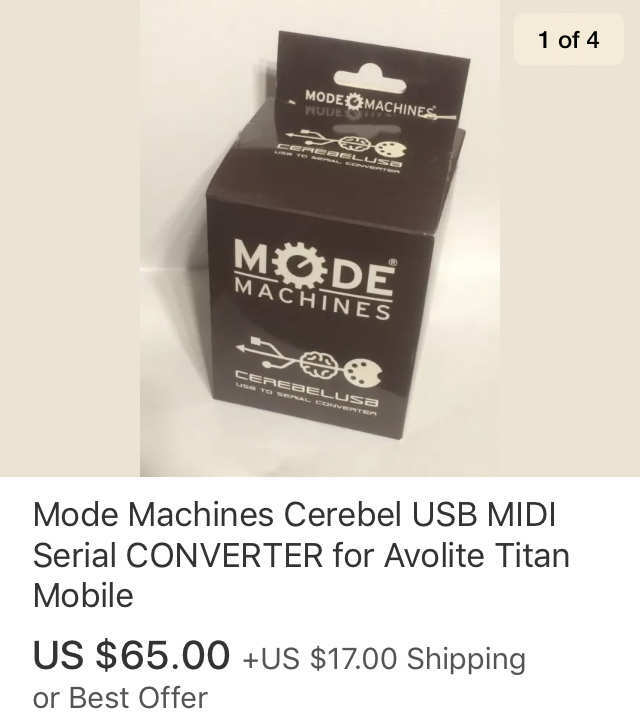 What you need is a USB HOST to MIDI converter like a PUC+ (5pin either in or out), the already mentioned Kenton, an iConnectMIDI2+, a MidiTech USB MIDI host, a Mode Machines Cerebel V2 (5pin MIDI Out only) or the like. If Ive understood, this is to connect a usb midi controller to a midi music module. That’s how I understood it. Hence the Kenton which allows you to use a controller that only has a USB output and convert that to 5 pin DIN midi to connect to anything that has midi in. If you just want a normal midi interface just take a look on any of the big audio retailer’s sites and you’ll find loads of them that will actually work. Don’t buy a cheap Ebay or amazon device unless you like unreliable devices. I reccoment the Puc+. Works great for me. $80. It has a usb midi input micro usb port, and a midi 5 pin port that can be used for midi input or midi output. The usb midi input can be sent to the 5 pin midi output. 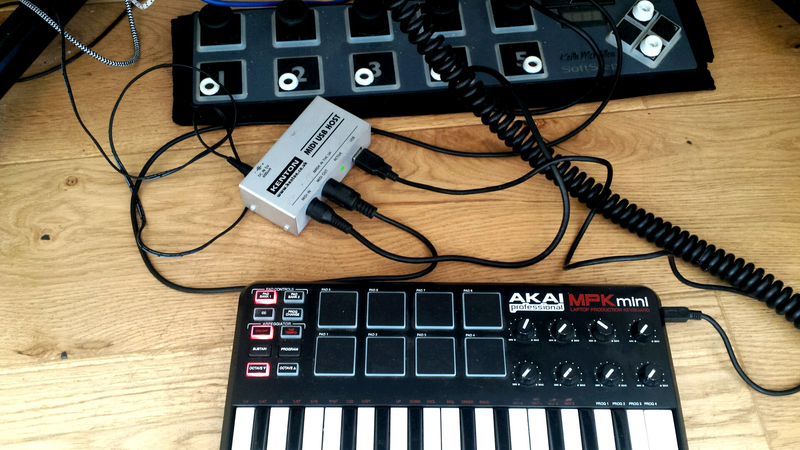 Turn any usb midi controller into a Bluetooth controller. It is not necessarily designed to do what you ask, it’s more Bluetooth oriented, but I do believe that it does what you need it to do. I just had to remap my usb midi controller to avoid conflicts with instruments connected to the 5 pin midi out, bc the puc+ sends the usb midi input out the 5pin midi out. Hobbytronics is probably the cheapest of the lot. 56$ plus 14$ US. That’s 70$. That’s with no plug in. It does midi signal filtering too, that’s cool. Puc+ is 80$ and does usb to midi plus Bluetooth midi and will run on batteries. Cool find, thanks for dropping the name. 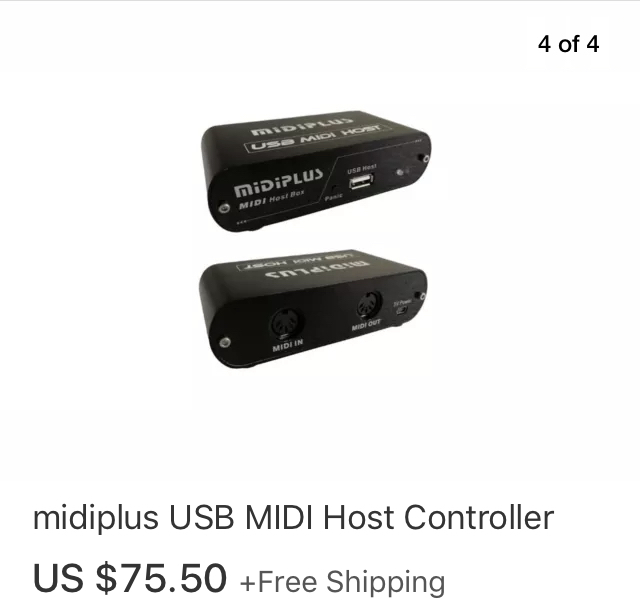 Here’s a couple more usb midi Hosts I’ve come across in my searches. This is probably the cheapest plug-and-play solution with both MIDI input and output. Well, for one I’ve used iOS, CCK, USB hub, and USB to MIDI. I’ve used this old EEE PC with Linux on it and the same idea, and I’ve used iCA4+. My go to solution is to just use an iPad or iPhone to get from USB MIDI to non-USB 5-pin MIDI. Check carefully since kenton don’t allow hubs meanwhile cerebel yes. So price is not related to specs and not all are equal. Or try the raspberry pi way. OF ALL THE IDEAS GIVEN TO ME HAVE ANY OF YOU USED THE METHOD OR DEVICE YOU ADVISED? Yes I use the puc+ in my setup every Wednesday on our Improv Jam Show on twitch.tv/tremendm_labs channel.👍 All the vids are there and on YouTube, it is the Perfect_Glitch_show. I just put it between mpk mini and circuit and it works as expected after configuring all the knobs to circuit's macros. The arp is syncing fine too. 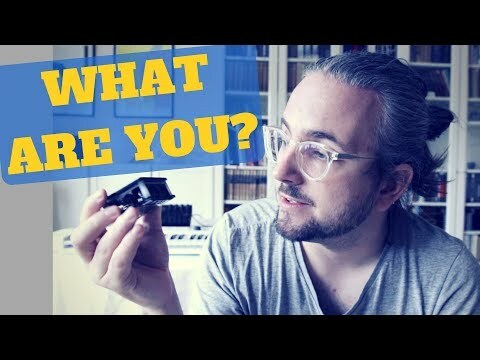 God, those knobs on mpk mini ARE wobbly. I haven't used it for a while.